The beauty of a self-drive campervan holiday means you can take your time and explore destinations without the restraints of a guided tour. But have you ever wished you could do a self-drive holiday, but still enjoy the advantages of having your own personal tour guide? Tourism Radio offers a solution to your dilemma, and will make your driving holiday even more enjoyable and relaxing. When you pick up your motorhome hire from the below companies, ask for a Tourism Radio Guide to be installed in your vehicle to ensure you don't miss out on anything. Tourism Radio's smart GPS technology reads your location as you are driving, with a tour guide commentator keeping you up to date with where you are and pointing out surrounding highlights. They will even suggest interesting places to visit nearby. The radio itself is programmed with more than 2000 points of interest throughout New Zealand, ensuring every part of your driving adventure will be filled with interesting information. If you spot something enticing in the distance, instead of trawling through maps and tourism guides to find out what it is, your Tourism Radio will let you know as you approach it. Take the hassle out of finding your way around New Zealand's towns and cities. "Need to Know" information on 150 of them, including what to see and do, the history of the town, interesting facts and geographical points, are stored in these devices, ensuring you can make the most of your experience. International travellers please note that Tourism Radio is only available in English. Attach the holder to the back of the unit. Find a suitable position for the unit on the windscreen. Press holder firmly into windscreen and push grip level downwards. To supply power to the unit, plug one end of the power cable into the cigarette lighter and the other end into the unit. Tune the vehicles FM Radio to 102.9 FM or 105.0 FM or any other unused frequency. Wait for the yellow position light to start flashing than select the same frequency as you have set on the radio by using the arrow buttons on the front of the unit. If you have any problems feel free to call Tourism Radio free on 0800 868 769. 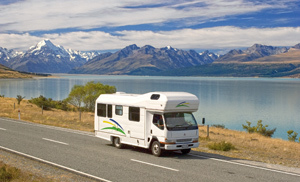 Tourism Radio is the easiest way to see the best of New Zealand on a self drive holiday. 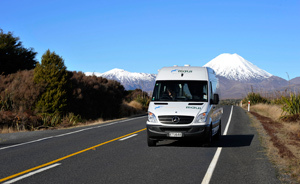 Know where you are, where to go and what to do by including a Tourism Radio in your next New Zealand Motorhome hire holiday.